Ken had from school times decided to marry his long-time partner Margie and the two had lived together for eight years. The two had two children, one of whom was in school when this happened. On June 16, 2013, Ken, a born again Christian married to Margie returned home from work to the revelation that his wife was leaving. “And it was at this time that I looked at the children clearly only to discover that the children resembled Jacob in everything and I broke down, I knew my wife had been cheating on me, she was unfaithful to me,” Ken adds. “And you know I had seen this man come to my home several times and at times he would go away with my wife and they would stay long out before she came back to the house. One time when I rebuked her about the same, she told me that the man [Jacob] was his maternal uncle and that no element of rebuke would separate them. And at the time she made a decision to leave my home, she disclosed that Jacob was her husband whom she had introduced to her parents in her village in Bumawosa, Sironko District. This came as a shock because I had also introduced her to my parents in Mbale town in the home of one of my uncles and paid bride price. “I prayed to God, accepted the situation as my wife packed and went away with the children. I stayed in doors for about two days praying and I have since then accepted my situation and I am moving on,” said Ken. Ken says in his village, traditionally, his ancestors valued relationships and would keep monitoring the wives at birth to find out whether the children resembled them or not. “And none of my relatives ever came in my home, I kept it a secret in Kampala here because I never wanted to be disturbed by relatives but I have since discovered that relatives are key,” says Ken. According to a marriage counsellor Maria Nabukonde from Sironko [Busiita] the practice of relatives scrutinising of children after birth scared women from cheating on their husbands because they would be discovered. “After birth the grandparents and the auntie would visit the home to find out the type of child produced. They would look at the child, undress to examine the parts of the body and would occasionally say, yes, this part looks like his fathers, this other part looks like that of his auntie who died and so on and so on, just to ascertain whether the child belongs to the clan or not,” said Ms Nabukonde. She adds that women who had relationships outside their marriages would begin panicking at the level and that in some villages there are women who took off when she discovered that grandparents and aunties where coming to visit her after birth. Ms Nabukonde says that in traditional marriages, there was trust, mutual understanding, a strong, healthy relationship can be one of the best supports in your life. “In traditional Bugisu society marriage was like an investment. The more you put in, the more you get back. Love and relationships take work, commitment, and a willingness to adapt and change through life as a team. Learn about ways to keep a healthy relationship strong, or work on repairing trust and love for a relationship on the rocks,” says Ms Nabukonde. She adds that many people marry out of fear and avoid divorce out of fear — fear of living and dying alone. The truth is that there are far worse fates than being young and single or old and alone. Young or old and married to an incompatible or violent partner is a guarantee that life will never be better. Nabukonde says that a spouse’s unfaithfulness is the most painful experience that can be inflicted in marriage and advises husbands to traditionally constantly check on their children, allow grandparents, aunties have time to establish whether the children belong to you or not. Dr. Ritu Khanna, a consultant psychologist of Apollo clinic in New Delhi, India says infidelity, when it occurs, it is one of the most painful experiences a relationship will probably ever experience. When one partner is unfaithful, it can shatter a relationship and leave the other person wondering whether it is worth salvaging. “Dealing with infidelity in a relationship requires tremendous resolve on the part of the betrayed party. How do you let go of the past? How do you justify or understand why your spouse felt the need to cheat on you? Knowing where to start is often the most difficult thing,” says Dr. Rhitu. She addes that unless there has been a volcanic act of violence, when people finally decide to end a marriage, it is always a calculated act usually preceded by years of unhappiness, a change of circumstance, an emotional upheaval, or a fissure that becomes a canyon of regret. “Growing old with a partner where life is suffused with resentment, indifference, and a lack of respect and caring is a life wasted. Living in a marriage where love, respect, friendship, and compatibility are gone is a life without hope. 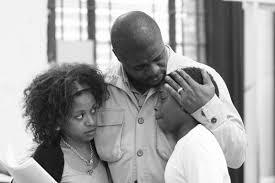 Where you are looking after children who are not yours because of a cheating wife is difficult. Many people believe that nothing is perfect and living with someone whose flaws they know is more comfortable than trading the known for the unknown with someone new,” says Dr. Rhitu.